1. No car rides! Leave the pups at home. Even in the morning time, your car can rapidly heat up, and that cracked window does nothing to keep them cool. A car can overheat in minutes at 70 degrees. 2. Exercise them in the early morning, when the air and pavement are coolest. 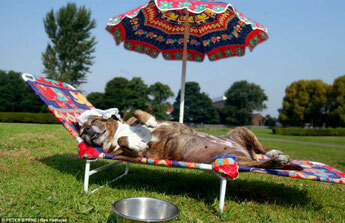 Hot pavement can easily burn their paws, and exercise in the hot afternoon can lead to heat stroke. 3. Make sure they always have access to cool water. Use ice cubes, give them frozen veggies as snacks (mine love frozen green beans and carrots). You can even make frozen low sodium broth cubes in ice cube trays to encourage hydration. 4. Keep them safe at the river/lakes. Bring potable water with you for them to drink and prevent them from drinking from river/lake. If you wouldn’t drink it, don’t let them drink it. If they are swimming, use a doggy life jacket to keep them safe. Keep an eye out for algae advisories-some locations have toxic algae blooms going on, and this is dangerous for both humans and dogs. Also, watch out for dead fish!! Dogs love to snack on them, but in our area they can get a parasite from eating fish that can make them very ill (commonly known as salmon poisoning, although other dead fish can carry it).